This weekend the Catholic Church celebrates the Feast of Christ the King. This feast has only been on the calendar for about 80+ years. What do the Orthodox think of such a feast? Do the Orthodox have a similar feast day on their calendar or devotion? This weekend the Catholic Church celebrates the Feast of Christ the King. This feast has only been on the calendar for about 80+ years. Golly! 80 years? That would constitute an ancient tradition in the post Vatican II RCC! What do the Orthodox think of such a feast? The same thing we think of any RC practices: Do whatever you like. Do the Orthodox have a similar feast day on their calendar or devotion? We don't have "devotions" to Christ, we worship Him as God. It was instituted to push the "social reign" of Christ. To Catholics back then this meant the subordination of all nations under the temporal supremacy of the Pope. Since they think the Pope is "one and the same head as Jesus Christ" this is abominable. Who is king? The Pope is. Whats really funny is that the liturgical Protestant churches now celebrate this feast too. If we take away the original motive for instituting the feast, and put it in a nonpapistical context, I think the feast is great! The great apostasy has occured. Get out of there while you can!!! Its better to be priestless than to have a heretic bishop. The apostles taught that the church consists of saints only. There are about 7,000 Spirit-bearers currently in the catacombs. I think it would be more correct to say that the Ordinary liturgical form of the Roman Rite of the Catholic Church will celebrate this feast tomorrow. It's important to note that the other expression of the Roman Rite - the extraordinary form - celebrates this feast on its original date of the last Sunday in October, thus bringing out the symbolism of Christ's reign in his saints, who's feast day occurs in the Roman Rite on November 1. This is a venerable tradition that still lives on in the Roman Catholic Church, through the extraordinary form of the Roman Rite. As an Orthodox Christian, I don't see anything wrong with this feast. I don't think it is bound up with the temporal authority of the Roman Pontiff. Rather, it is about the authority of Christ to reign over all people and societies. In a Roman Catholic context, this would logically mean that the Roman Catholic Church should influence the laws of countries. However, this is more of a reflection of the right of the true religion to influence the State, than any emphasis on the Pope, per se. Since Orthodoxy is that true religion, this feast day could be interpreted to state that Christ in the Holy Orthodox Church should influence all people and societies. Btw, does anyone know if the Antiochian Western Orthodox Vicariate celebrates this feast? Thanks. I don't know (unfortunately I don't have my Orthodox Missal with me), but we have an attached Western Rite priest in our parish. If he comes tommorrow (he lives quite aways, a several hour drive), I'll ask. I myself don't have anything against it per se. Does anyone know when the Western Church began their Ecclesiastical year before Christ the King was instituted? The Western Church has begun their ecclesiastical year on the first Sunday of Advent for many centuries. The imposition of the feast of Christ the King didn't change this. And by your implication, we don't? Your tone appears to be uncharitable. ozgeorge I to like you must love the Catholics and all humanity but when the Catholics on this board reach out for an opinion on a matter and don't like the answer why do they react in such a manner. 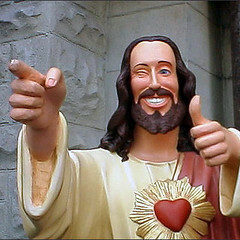 I don't see though how the feast of Christ the King is equivalent to your objections regarding the Sacred Heart. Christ is worshiped in the feast and honoured with special remembrance of his title as King. I know very little of the Orthodox calendar but how is that different for example, from venerating the Mother of God with special reference to her Holy Protection? Because Christ is God and the Theotokos is not. I see that the Antiochian Archdiocese has allowed one of its Western Rite missions to adopt the name of "Christ the King." Can't wait for the Sacred Heart Parish. I am just wondering if there are icons of Christ the King? There are icons of Christ the King of Kings and of Christ the Great High Priest (both are similar.) But I do not think that the meaning attached to these icons is the same as the modern Roman Catholic devotion. I am just wondering if there are icons of Christ the King? The Icon of "Extreme Humility" (sometimes called "The Bridegroom"). The inscription on the Cross reads: "O ΒΣΛΣ Τ ΔΞΣ" Which is the abbreviation for "O ΒΑΣΙΛΙΑΣ ΤΗΣ ΔΟΧΑΣ" ( "The King of Glory"). George that is a beautiful icon I have never seen it before. Only put out on the analogion for the Bridegroom Vespers for the first three days of Holy Week. "Behold the Bridegroom cometh in the middle of the night and blessed is the man whom He shall find watching...."
and coming in the likeness of men. to the glory of God the Father." "Let this mind be in you" says this ancient hymn. In other words, like Christ we should see where true Kingship lies, not in palaces of power, but in the humility, obedience, and self-emptying ("kenosis") of Christ. That's funny since this feast was instituted over 50 years after the Unification of Italy. What is meant by the social reign of Christ is a subjection of all nations under Christ - but not in the sense of being under the Papal States. It would be like the sense of the ending of the Gospel of Matthew "therefore go and make disciples of all nations" and the Byzantine Christmas Hymn "understand all ye nations and submit for God is with us". Perhaps we could have a thread discussing the meanings for us of worship and devotion. For the Catholic Church, worship (in the modern English definition) is essentially a liturgical act. It is the full giving of all we have to give (glory, praise, etc.) to God since He is God. This is exercised most perfectly in the liturgical life of the Church (Mass, Divine Office, Benediction and Adoration, etc.). Devotions can be directed to either God or His Saints. When directed to God, it is still an act of worship, but one that is more private than corporate (though groups can and do gather to practice the devotions together). A devotion is generally focusing on a particular aspect of the Mystery of God. In the Byzantine tradition, an example of what a Catholic would consider a devotion is the Jesus Prayer. This is very brief and somewhat incomplete, but hopefully it illustrates the point somewhat. Well, you said it. A little humility could do you some good. I don't mind being criticized, I just like it when there's an explanation attached. Not to be judgmental, but where have you been spending your evenings in Great and Holy Week? I can be as nit picky as any on the Latin practices, but the Christ the King I fail to see a problem. How do we EO's (Constantinoplean rite) start ALL are prayers? Come, let us worship God Our King! Come, let us worship and fall down before Christ, Our King and Our God! Come, let us worship and fall down before Christ Himself, Our King and Our God! I asked the WRO priest. Yes, they celebrate Christ the King. It wasn't on the original calendar, as it wasn't on the Benedictine in 1870 when the Russian Synod approved the WRO: at time only a theory, no one was asking, but the Russians were already getting people converting to Eastern Rite. The Russians, I was told, are attached to St. Benedict, and indeed I've seen his icons in places where no one would approve WRO. Father added that the feast was added when the patriarchate of Antioch took the acts of the Holy Synod and put the theory into practice. Father added that the feast was added when the patriarchate of Antioch took the acts of the Holy Synod and put the theory into practice. So do the Western Rite and/or Antiochene Orthodox have a Feast of Christ the King? I think under Joe's rule on CAF, you would have been given a serious PM if you had posted this over there. You don't have to agree with us, but you could at least show respect. Well, Magicsilence, I can't really contradict you, as I know very little about how things are done at CAF. (I'm Catholic, BTW, but I very rarely read anything at that website and haven't ever posted there, at least that I recall.) But I do have to question the relevance of your comment, seeing as the topic of this thread is "Orthodox and the Feast of Christ the King" not "CAF". I'm calling for a little respect, and not mockery of our faith. The CAF reference was just to put my comment into perspective. I think if you read the thread in sequence you will see my point. 1) I said Orthodoxy worships Christ, not "has devotions" to Him. 2) lubeltri said that I was implying that RC's don't worship but have devotions to Christ. 3) I pointed out the First Fridays devotion as evidence to the contrary. CAF?......CAF?......Now remind me- what exactly happened there again? Oh that's right! An entire archive destroyed, never to be seen again, and people being secretly banned. George, you could never be a Catholic, for it is a "both/and" faith, not an "either/or." You fail to understand that we can have pious devotions to Christ the Lord as well as worship him as God. When you wrote, "We don't have devotions to Christ, we worship Him as God," you implied disrespectfully that we don't worship Christ as God. That's false, of course. Have you ever been to a First Friday adoration? We certainly do worship him as God in our devotions as well as elsewhere! Magicsilence was only pointing out your unfortunate lack of charity. for it is a "both/and" faith, not an "either/or." Kind of like the Ba'hais? You fail to understand that we can have pious devotions to Christ the Lord as well as worship him as God. I know. Which creates the confusing situation of considering Christ an object of pious devotion vs. deity. Kind of like "Buddy Jesus". Magicsilence was only pointing out your unfortunate lack of charity. "Lack of charity"? Should I not express my opinion in order to "maintain charity"? Oh, I forgot who I'm talking to. Now where else have I seen the attitude of "not permitting contrary opinions equals charity"? You got that right! Kind of like the Ba'hais? I know. Which creates the confusing situation of considering Christ an object of pious devotion vs. deity. Kind of like "Buddy Jesus". I am sorry that my post led to bickering. I will try in the future to choose my words more carefully. I really don't think it did lead to bickering. It lead to the highlighting of a difference of opinion; that's all. People are most welcome to disagree with me. It's not as if it's simply a case of "Orthodox vs. Catholic"- Look at my posts; I even disagree with the opinion of the Antiochian Orthodox Archdiocese! On the cross often is the inscription: King of Glory. But I think there is no need for a new "Devotion" he was always venerated as King in orthodoxy ! Yes, but it's the pre Vatican II date, in October I think is what he said. Fits in before the eschatological tone of the origins of Advent. How's an Akathist not a devotion? Please keep this thread on topic for those who wish to discuss the Feast of Christ the King. And that WRO mission is now defunct, not that there's any connection to your observation. Part of the impetus for establishing the new feast, was that society was (even more so today) denying that Christ has the right to be King. This feast is to remind us that Christ has the right to be King, not only in a private personal relationship, but over society as a whole. A good work on this topic was done by Michael Davies. You can read his book The Reign of Christ the King at the link - or you can buy it for a couple dollars at TAN Books. I'm still interested in that difference pointed out earlier "Because Christ is God and the Theotokos is not". I guess it is something to do (again) with the hypostatic union but unlike the Sacred Heart, the objection is not so readily apparent to me. Are you being serious mate? No thank God (literally) that this is not real but from the movie Dogma which is taking a satirical view of seeker sensitive churches and the Catholic attempt at making it more "open".